It’s hard to believe that one year ago today, I launched my blog. The last 12 months have brought more milestones than I ever thought I’d reach and has allowed me to be part of an amazing community of writers and readers. My gratitude goes to all of you for deciding to follow my journey as a writer and creative spirit. Your presence as readers and commenters is so encouraging, inspiring, and very much appreciated. As my muse and I grow, my blog continues to evolve, which means both new and old followers may not be aware of everything hiding in the nooks and crannies of C.B. Wentworth. So, it seems the only fitting way to celebrate my one year anniversary is to take a look at how far I’ve come and where I’m heading next. Let’s take a tour! There is a small menu of page links that divide the content of my blog. About – Like most bloggers, I wrote a little blurb about myself and the purpose of my blog. Perhaps I got a bit too whimsical, but I stand by the arguments I have with my muse! My Bookshelf – Did you know I keep a log of all the books I read? Books I’ve enjoyed from 2010, 2011, and the growing list of 2012 are all listed on My Bookshelf. This year, I started writing snapshot reviews and providing links for each title. I update this page regularly and leave comments open for book discussions, debates, and recommendations for further reading. Home – The main page of my blog is where all new posts appear. I write on a number topics, which are represented with category links below the main header. Content is pretty random and that’s largely because I don’t believe in limiting where my muse can go. If anything, I like the element of surprise for both myself as a writer and for readers. My voice, however, is what ties everything together. I’ve been told I have a unique personality and it comes through in everything I write! Blog Schedule – I post three or four times a week, typically Monday, Wednesday, Friday, and Sunday. However, there are weeks where I’ll post every day. It depends on how chatty my muse is and how much time is available to write. Comments – Every post is open to comments and I make it a point to answer every single person who leaves a comment. Reader thoughts are important to me and I enjoy the conversation. Wreck This Journal – This series documents the pages I complete in Keri Smith’s groundbreaking book of the same title. I’m happy to say this series has inspired a number of people to buy their own Wreck This Journal and embark on a similar journey of reckless creativity. Project Art Journal – This series showcases pages from a journal I created with paper lunch bags. Each page is constructed using mixed-media collage and I provide step by step instructions for the techniques I use to create each layout. Sundays in London – A three week sojourn to London serves as the inspiration for poetry and musings. Every Sunday I post a photograph from my adventure, along with the words it inspires. 2012 Goals Status Report – At the end of every month, I hold myself accountable for the writing goals I’ve set for 2012. I document both successes and failures as they occur to keep myself on track for the year. In between these regular series is where random topics run rampant. A post without the aforementioned titles is one where I’ve wandered into fiction, travel, books or any of the other categories listed under the main header. The main photograph is my actual bookshelf. I took this shot with my cell phone and played with it on iPhoto until I got it to match the color scheme of my chosen theme. Every photograph on my blog is my own, unless otherwise noted. Subscribing to my blog is as easy as clicking on the “sign me up” button. Thanks again to those who have already done so! Over on Facebook I’ve create a writer page, where I post blog updates, links to other blogs and sites, announcements, and general musings about writing. Clicking “Like” button opens up these features and I love it when people write on my wall. My Twitter Tweets chronicle my writing process, books I’m reading, and fantastic inspirational quotes I find in a variety of places. Click the button on my sidebar and we’ll tweet together! Pinterest is my newest obsession. The crafter and artist in me can’t get enough of the visual inspiration this site has to offer. I pin everything from upcycling projects, photos of my dream flat in London, and art journal pages. Click the red button on my sidebar to see what I’m pinning and to follow along. I recently joined the World Literary Cafe to network with other writers and readers. So far, it has been an amazing experience! I’m still learning the ropes of all it has to offer, but I highly recommend it to anyone looking for information about how to network. I joined goodreads a few months ago, because I loved the idea of the 2012 Reading Challenge. I have a goal of reading at least 30 books this year and so far, I’m right on track. Musings of a writer is a little section where I place random quotes that pop into my head. I don’t change it very often, but I always try to come up with something that represents my philosophy of what it means to be a writer. In the Recent Posts section, I keep a listing of the 50 most recent blog entries. My tag cloud is just as random as my posts, so I guess that’s another indicator of how my muse works! Clicking on any one of those tags will take you to all my posts relating to that topic. I’m sorry to say my Blogroll is in dire need of updating! I have about 30 blogs to add, but the current list of blogs are still among my favorite. I visit them daily for a great read and endless inspiration. The Campaign Shield serves as my badge for surviving my first Writers’ Platform-Building Campaign. The campaign was worth participating in as I met so many wonderful bloggers and I really enjoyed the challenge of tough writing prompts and competition. I’m still in shock that I won the last competition, (See Fatespeak)! Thanks to some fabulous bloggers, I’ve been lucky enough to receive several blog awards. There’s nothing quite as encouraging or gratifying as another blogger acknowledging my work. I appreciate every single one and those who gave them to me. I keep all the logistical information at the bottom. This is where the archives, calendar, and blog stats reside. I wish it was more exciting, but alas there is always a corner for the technical stuff! My gravatar photo is the same photo I use for all social media. 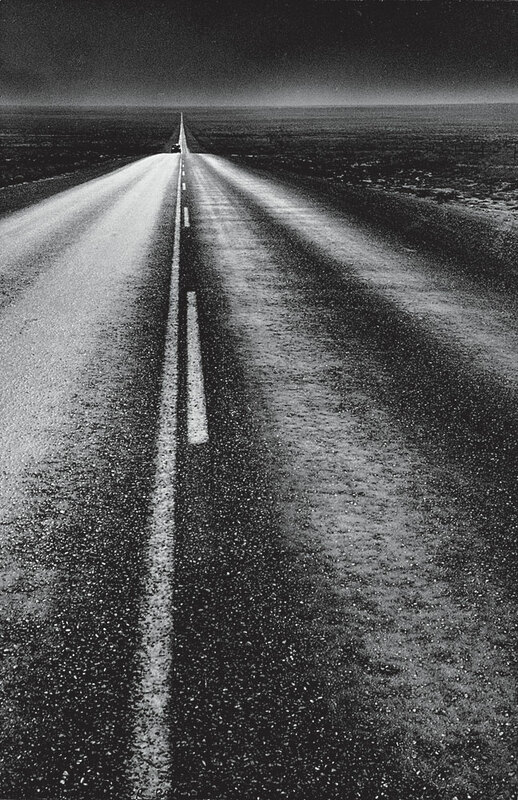 The meaning behind that black and white road can be found on a post entitled, One Photograph Changed Everything. My icon photo is a collage I created and photographed. 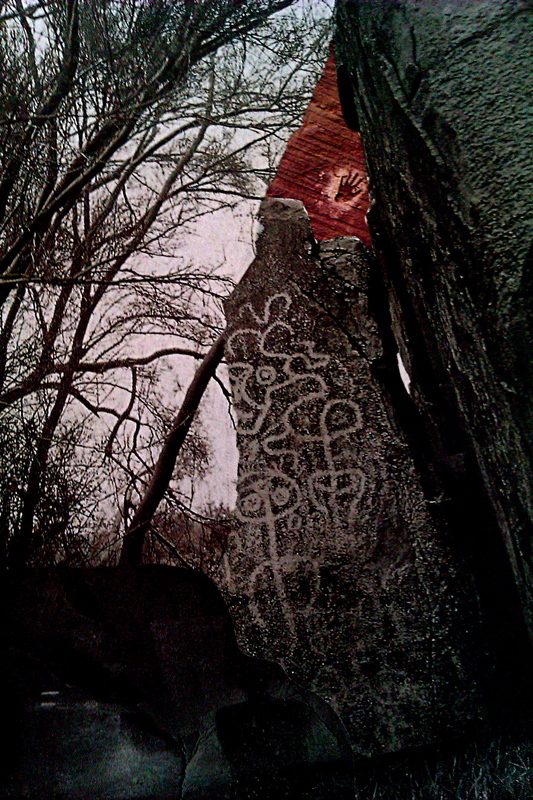 I pieced together magazine photos of trees, cliffs, and petroglyphs. The emphasis on the hand in the center is symbolic of the human journey in which we all travel. Back in August, my post The Best Souvenirs Are Free was chosen to be Freshly Pressed. I wish I could properly convey how exciting that was, but I still can’t find the right words. Project Flash Fiction – As summer approaches, I’ll be embarking on a challenge to write one piece of flash fiction every week. Finish This Book – With Wreck This Journal winding down over the next couple of months, Keri Smith’s most recent book will be my next source of reckless creativity. Pages and experiences will be posted on a bi-weekly basis. Pinhole Camera Adventure – On a whim, I bought a kit for a pinhole camera and I plan on documenting the experiment from start to finish, including the photographs I take with this contraption! Project Upcycle – Pinterest has turned me into an upcycling fanatic. I have several projects lined up and I’ll be documenting each one as they are completed. Q&A Journal – Another summer project where a question a day can lead to anything. A weekly post will document my answers and the inspiration that will likely ensue. Thanks again to all my readers, new and old! This year has been an incredible experience and I can’t wait to see what is yet to come. Happy Blog-anniversary. I love your stuff, here’s to the next year of posts! Thanks so much! 🙂 I can’t wait to see what my muse and I compose. Hopefully, another great year is in store. Congrats on reaching your one-year! I just realized yesterday that mine is a month away, and I need to start planning something big (ish). ooh, I can’t wait to see what you do with Project Upcycle! Oh, fun! 🙂 Can’t wait to see how you’re going to celebrate. I worked on something for Project Upcycle last night and I cannot wait to share it! Thanks! 🙂 I hope the next year is just as fun and inspiring as this one has been. Congratulations on one year! And I enjoyed your “tour.” 🙂 So often a person is flying through blog posts across many different blogs and doesn’t take the time to stop and see what else each blog has to offer. Your tour has given me a few ideas for improving my own blog. 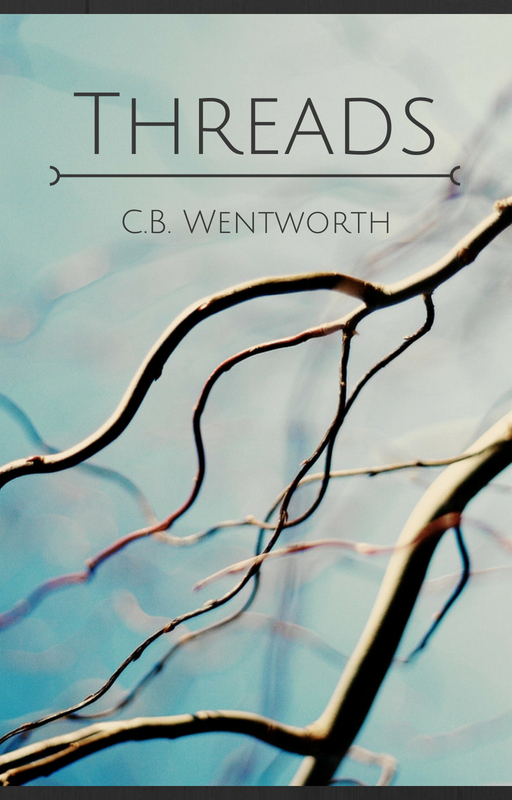 Your blog has become one of my favorites, C.B. Thanks to Platform Builders for helping me find you! Seriously, you have a great blog and I’m glad I’ve had a chance to read about your journey. Keep up the good work! Blogging is a commitment, but one I enjoy very much! What a good idea to recap your blog for newcomers (and those of us who don’t notice details all the time.) Congratulations on your one year anniversary! I was also interested to read you have a sort-of blogging schedule 3-4 days a week. So much here to explore. Thank you, C.B. Hopefully, the next year will bring much more to explore! Awww, thanks! 🙂 It did not look this nice in the beginning! I did a lot of experimenting until I found my groove! Blogging has inspired me to play with my camera a lot more and visuals are always key to inspiring words for me. With these elements in place, I’m excited to see what the next year brings. Congratulations on a year of fantastic blogging. I look forward to watching you grow and share even more in the coming year of your blog. Thanks! 🙂 I have so much planned, yet I’m leaving plenty of holes open for surprises to find their way to my muse. Stay tuned! I wasn’t sure if it would be fun, but I’m glad to hear you and others liked the tour! GIANT congratulations on your one year anniversary, and kudos for all of the many wonderful things you do and are planning to do. Your regular posts always serve as inspiration to think, write, read, play, explore and enjoy all of the opportunities presented to us creative folks. It’s been a pleasure to follow along, my friend, a great pleasure! Thanks so much! 🙂 You are such an inspiration to me as your blog is always full of so many thought provoking posts. I’m so glad we’ve connected and continue to share our journeys of self discovery and creativity. Congratulations on your 1st year. Here’s to many more. Happy Birthday C.B.! I’m so glad you were Freshly Pressed, ’cause that’s how I found your blog. And you are one of my absolute favorites! I hope you find year two to be just as creative, exciting, inspirational, amazing, and whimsical – gotta keep that Muse happy!!! Thanks so much! 🙂 Its amazing how having an outlet can inspire so much. May we both continue to find exceptional inspiration. You’ve got a great thing going . . . keep writing! Congratulations to your blog anniversary! You’re very well organized here! I started January 1, 2011, when I joined the Post-A-Day. Then, when the year was up, I moved [very briefly] to Blogger. Got sort of homesick for WP, so here I am .. back again, and today I noticed that I posted my 100th post with this blog I have now. I have Goodreads too, but I only read romance novels before I fall asleep … light reading. I’ve just found a marvellous, British writer who really fits my taste [Erica James]. Congrats! One Year where does the time go. Looking forward to all your new adventures. Thanks always for reading and for being such a positive force in my life. Congratulations on your one-year anniversary! I look forward to your blog posts and am glad we’ve connected. I’m impressed by your dedication and consistency. Here’s to many more years of blogging! Cheers! May we both continue to find inspiration! Thanks for sharing your many talents with the world! Yes, the “Best Souvenirs are Free” blogpost got me here and I’m glad it did (thank you FP for getting it right!) And now I get to read all these short stories, your craft & stuff, that I really love here! Thanks for sharing! Happy Blogobirthday, C.B. You give me so much inspiration, and are such a steady blog companion. I really appreciate your talents and your sharing of those talents and for spreading the love. Here’s to another great year! May we both have another prosperous year of blogging! Truly inspirational, C.B. Wow, is about all I can say. Happy Anniversary! So glad you are here doing what you do! Thank you so much! 🙂 I’m always so glad I stumbled on your page – Yoda caught my eye and I’ve enjoyed visiting your site ever since. We have so much in common and I’m so glad we connected! go you!! keep being so incredibly awesome and filled with the wisdom of words! xo. Can’t wait to see your upcoming projects!